The William S. Haynes Company began the manufacture of a double-wall, sterling-silver clarinet, based on the principal of a thermos flask, in 1926. The fabrication of this instrument continued until 1942, resulting in a total production of only 334 examples. It was the only time in the history of the Haynes Company that an instrument other than the flute was produced. The patent for the thermoclarinet was filed on March 19, 1926, and awarded patent number 1,715,162 on May 28, 1929. The instrument consists of two, hard-drawn, sterling-silver, seamless tubes, one within the other. The bore of the inner tube matches that of a regular wood clarinet. Similarly, the outer tube matches the exterior size of a wood clarinet. Between the two tubes is a one-eighth-inch air space. A small slide, or louver, is placed at the end of the body, just above the bell. This louver can be opened, revealing the inner tube and exposing the air space. When closed, the space between the tubes is air tight. Near the top of the body is a second vent. This consists of an extended tube covered with a metal cap that renders it air tight. When the cap is removed, the outer bore is opened and the inner bore is exposed to the air. The procedure to warm the clarinet is simple. The bottom louver is opened and the top vent cap is removed. The player blows warm air into the top vent, expelling the cold air through the bottom. After several breaths the clarinet is warm and the vents are closed to seal in the warmth. The barrel of the clarinet also features a double bore. It fits tightly over the top of the body forming a tuning slide. 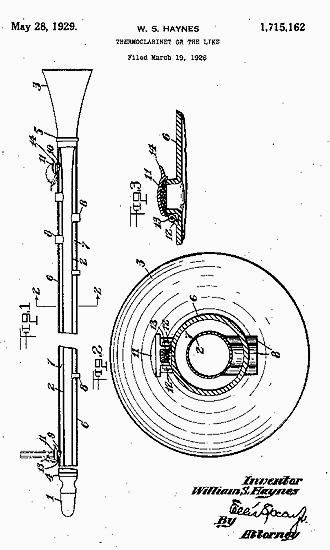 Nowhere on the thermoclarinet patent, nor in any advertising material or newspaper articles, is there any mention of Verne Q. Powell, co-director of Haynes at the time this instrument was designed. Yet, according to Powell, it was he who invented the warming device. So upset was Powell with this situation that he left the William S. Haynes Company, having worked there since 1913, to set up his own shop prior to July of 1926. Excerpted from Deborah Check Reeves, "Historically Speaking," The Clarinet 31, No. 3 (June 2004), pp. 28-29. NMM 5839. Clarinet in A by William S. Haynes Company, Boston, ca. 1926-1929. Three sections. Stamped on upper part of one-piece body: THE / HAYNES CLARINET / MADE BY / WM. S. HAYNES Co. / BOSTON, MASS. / 114 / PAT. APL'D FOR / TRADEMARK / A; on bell: REGISTERED / WSH Co [monogram] / TRADEMARK. Serial number 114. Double-wall, sterling silver. Boehm System. Articulated g-sharp''. Seventeen sterling-silver keys, six sterling-silver rings. Length (top of barrel to bottom of bell): 636 mm. Rosario Mazzeo Collection, 1995. NMM 6188. Clarinet in B-flat by William S. Haynes Company, Boston, 1929. Three sections. Stamped on upper part of one-piece body: THE / HAYNES CLARINET / MADE BY / WM. S. HAYNES Co. / BOSTON, MASS. / 138 / PAT. A'PL'D FOR / TRADEMARK / B; on bell: REGISTERED / WSH Co [monogram] / TRADEMARK. Serial number 138. Double-wall, sterling silver. Boehm System. Articulated g-sharp''. Seventeen sterling-silver keys, six sterling-silver rings. Length (top of barrel to bottom of bell): 591 mm. Gift of Robert F. Cole, Montello, Wisconsin, 1998. NMM 5838. Clarinet in B-flat by William S. Haynes Company, Boston, ca. 1929-1942. Three sections. Stamped on upper part of one-piece body: THE / HAYNES CLARINET / MADE BY / WM. S. HAYNES Co. / BOSTON, MASS. / 245 / PAT. 1715162 / TRADEMARK / B; on bell: B / REGISTERED / WSH Co [monogram] / TRADEMARK. Serial nmber 245. Double-wall, sterling silver. Boehm System. Articulated g-sharp''. Seventeen sterling-silver keys, six sterling-silver rings. Length (top of barrel to bottom of bell): 600 mm. Rosario Mazzeo Collection, 1995.